Fractured storylines, unreliable narration and meta-narratives have all become the requisite tools of the trade for films with a postmodernist slant. The realization by filmmakers as far back as the 1960s, when the enfants terribles of France’s Nouvelle Vague tore down the barrier between good "taste" and good "cinema", have not only prompted experimentation in plot and genre, but also, on occasion, led to genuine masterpieces. Of course, there have also been a plethora of over-inflated and pretentious works that have been released to varying degrees of fanfare since then. 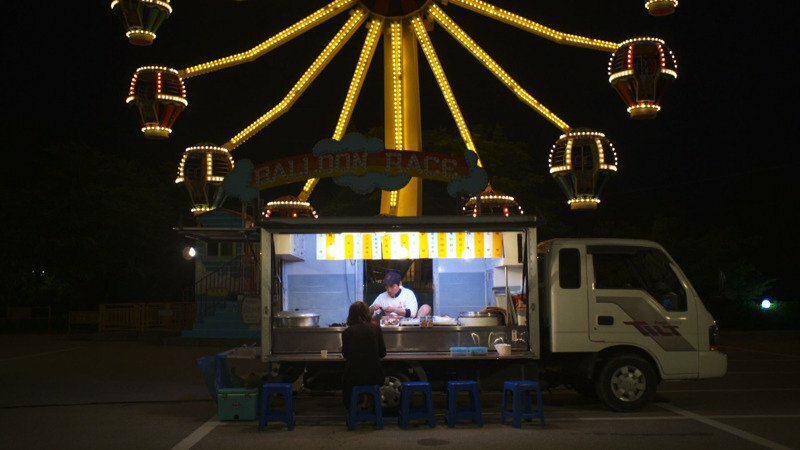 In writer-director Kwang-kuk Lee’s debut film Romance Joe (2011) the eponymously named Romance Joe is both an actual character in the movie, played by Kim Young-pil and Lee Da-wit, and an invention: a plot device, utilized by several characters in the film when telling their own personal/invented stories about the pain of love and the ways that fiction and fact can bleed together. Opening on a very formally composed and theatrical close-up shot of a black and white portrait of stampeding horses, the camera quickly pulls back to reveal a wall of rose printed-paper. The camera pans left to an elderly couple getting off an elevator, bickering with each other as they walk across the frame to their motel room. A few minutes later, inside their room, we hear what their argument is about, a prodigal son has gone off the grid and is now missing. From that loose thread will unfurl a series of stories within stories that comment on storytelling and in turn have you questioning exactly how the act of storytelling affects the way we perceive and respond to narrative. Luckily for fans of Korean cinema, many first time filmmakers emerging now in the festival circuit are not newbies fresh out of university, but rather old-hat’s in the industry working for one specific director on several productions. These apprenticeships have the effect of giving anyone with at least one good idea the skills to make a very well made and entertaining debut. Having worked extensively with Hong Sang-soo, Romance Joe bears the weight of the man that Lee had worked for. The copious amounts of drinking, awkward sexual encounters, narrative repetition, the placement of a filmmaker as a protagonist and also the deflation of romantic love are all earmarks of a Hong Sang-soo production. Yet while Lee’s film shares all these traits there is a playful and relaxed feeling to Romance Joe that many of Hong’s films lack even when dealing with serious themes like suicide and abandonment. In fact, I wouldn’t be surprised to discover that Lee Kwang-kuk was a fan of American auteur Wes Anderson. Both Anderson and Lee are fond of elevating general malaise into seriocomic poetry. A perfect example being the way the two scenes involving suicide in Romance Joe start off as a heavy moment, the camera cutting back and forth between Joe’s anguished face and his hand which is clutching a razor and positioned ready to open a vein. Before he can do anything, a young boy’s screams intrude on the soundtrack. We later find out that this displaced voice is Joe himself, as a young man about to stumble on Cho-hee (Lee Chae-eun), his first love, bleeding after she has committed suicide. Back to the older Joe’s story: a knock on his door and a young woman stumbling into his apartment stops Joe dead in his tracks. The woman, the coffee hostess Ri Ji (Shin Dong mi), quickly runs out of his apartment, embarrassed for walking in on such a private moment and Joe chases after her. This attempted suicide should be serious moment, but it reads far more like a twisted version of a cute meeting that one finds in many romantic comedies. With plot threads being told from multiple points of view, Lee adopts a very post-modern position that there is no such thing as objectivity in truth. Of course this is nothing new in cinema. Ever since the days of Rashomon (1950) films have played with the notion that all truth is merely an invention of the storyteller. And even during the early days of Korean cinema beginning with Kim Ki-young’s Housemaid trilogy all the way down the line to established contemporary classics like Lee Chang-dong’s Peppermint Candy (Pakha Satang, 1999) and even recent populist films like Cyrano Agency (Sirano; Yeonaejojakdo, 2010) or Architecture 101 (Geonchukhakgaeron, 2012) the use of a flashback structure as well as framing the narrative as a recounted tale has been a popular practice. In Romance Joe it is telling that Lee devotes some screen time to showing the reaction to the audience on-screen, specifically Director Lee (Jo Han-cheol) and Joe’s parents, who have spent a majority of the film listening to the multiple storylines in the film. Their reactions vary. The father is bored and has fallen fast asleep, but Joe’s mother (Park Hye-jin) and Director Lee, who has been suffering from writer’s block, are enthralled. The mother wants to “correct” the story by offering up a happy ending to Joe’s story all the while condemning Cho-hee for being a hussy and abandoning her role as mother. To Director Lee though, the story is merely fodder, base ingredients for a film that he is now excited to make: a cold and calculating thriller which he knows will mean big box office success for him. Commenting on these two populist strands of filmmaking in Korean cinema, romantic fantasy and Fincher-esque crime drama, Lee derails any chance for the viewer to find any comfort at the end of the film. Circling back to the very forest where Joe had rescued Cho-hee so many years ago we are primed for some sort of reunion between the two. We wait along with Joe for some sort of revelation to make sense of it all and give us some clue regarding Cho-hee's fate, but nothing of the sort occurs. The story merely ends with an irate Joe having an existential argument. Life is filled with pain and uncertainty but at least we can take comfort in the fact that we do exist and that we have a choice as to where the story of our lives will take us.